People ask us this question all of the time. About 19 years ago, each time we visited a friend a few miles away we found ourselves stopping at his neighbors to watch their miniature donkeys playing in a field. It wasn’t long before we started asking questions and looking for a pair of our own. We purchased our first jack and jennet from Meadow Wood Farms owned by Loyal McMillan, part of the Nordstrom family. 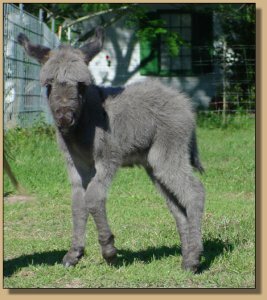 Our goal is to raise miniature donkeys with a sweet, calm disposition and excellent conformation. There’s something about coming home from a long day to feed the donkeys. They have so much personality it’s easy to unwind just being in the barn with them. We love our horses, but the donkeys are very different in many ways. Of course they don’t eat and as much and are easier to clean up after. They also have an inquisitive attitude and a long memory! Actually, unlike what many people think they are easy to train and respond best to patience and kindness. We provide excellent care of our donkeys by providing quality grain and hay, worm them frequently, and trim their feet as needed. There’s nothing better than watching our herd playing donkey games in the evening. They really are quite comical. Miniature donkeys are native to the Mediterranean islands of Sicily and Sardinia. 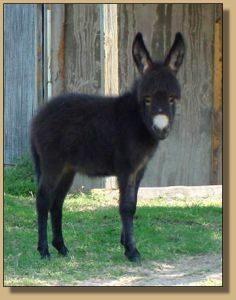 There are over 40,000 registered miniature donkeys in the United States with importations no longer allowed. As you can see by the small numbers, the breed is still needing to be preserved and cultivated. 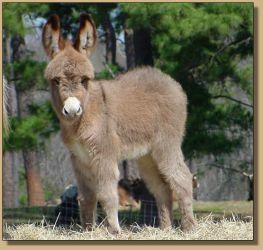 The miniature donkey is a true breed and is not bred down. The miniature donkey must be under 36" or less at the shoulder. The average height for them is 34", and the smaller they are the more valuable they become. Miniature donkeys have very long life-spans living to 25-35 years of age. 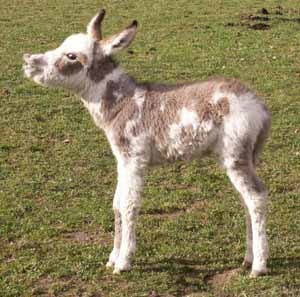 The most common color for the miniature donkey is a gray dun with a black "cross" running over their shoulder and down their back. 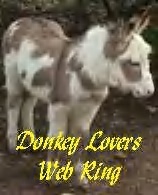 Donkeys do come in colors other than gray such as spotted, brown, black, sorrel. Black and red, however, are very uncommon colors and highly prized in breeding programs. Miniature Donkeys eat one to two flakes of good quality Coastal hay per day. 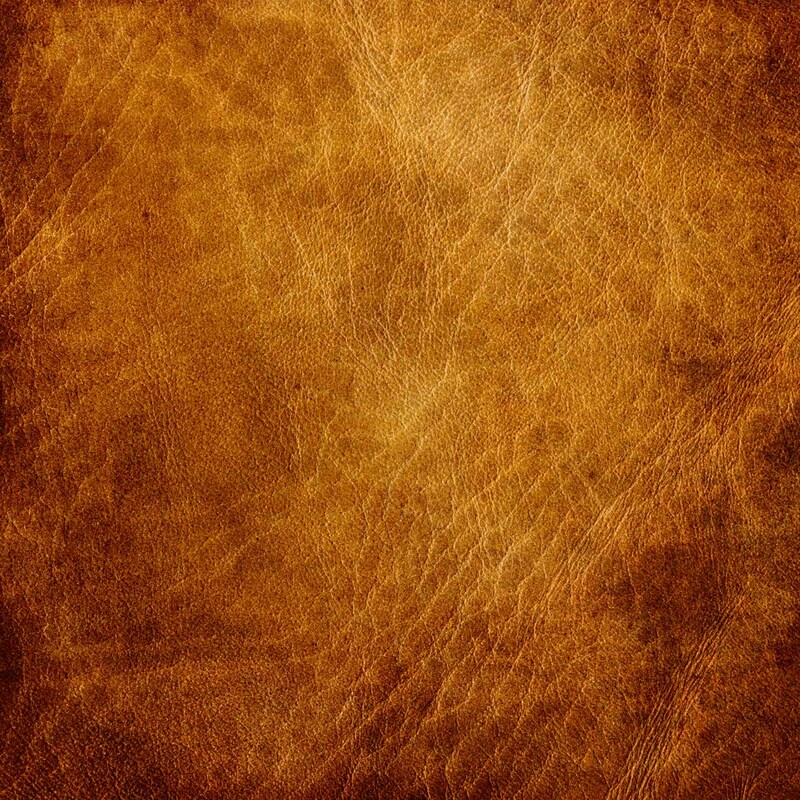 A trace mineral supplement should be made available to your donkey at all times. Donkeys love treats such as breads, carrots, and apples. Historically, donkeys are used to sparse food supplies and should not be overfed. Your donkey should have good, clean water 24 hours a day. Donkeys need a three sided loafing shed for protection against the cold north winds of winter and the hot sun of summer. 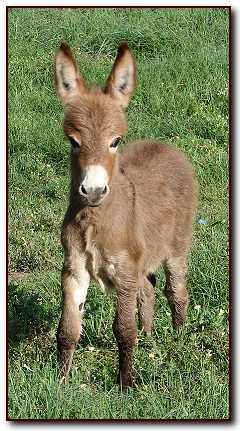 A single miniature donkey needs 1/2 to 1 acre of pasture. Miniature donkeys generally get along with goats, sheep, horses, llamas. Miniature donkeys are one of the most affectionate and friendly animals of their kind. 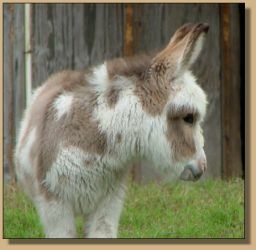 Miniature donkeys are tame, gentle, loyal, playful, and affectionate...the perfect pet. Miniature donkeys are very social animals who like to give and receive a great deal of attention. Miniature donkeys need annual vaccinations for Eastern and Western Encephalomyelitis, Tetanus, Rhinopneumonitis, Strangles, and influenza & the West Nile Vacc. If it is the first time the donkey is receiving the vacc. they will need a booster 3 weeks after the first and then annually there after. 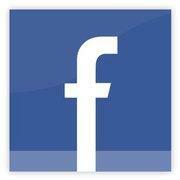 Hoof Care should be performed every eight to ten weeks depending, of course, on how rapidly your donkeys hooves grow. Terrain and diet are big factors in hoof growth. 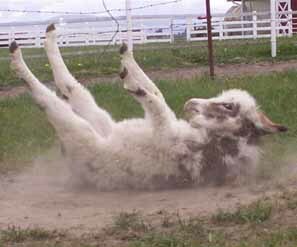 Worming should be done every 2 to 3 months. "Jack" is a male donkey that has not been castrated. "Jennet", or "Jenny" as some people say, is a female donkey. 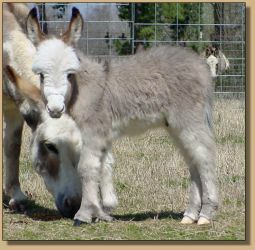 "Weanling" is a young donkey who has been separated, or weaned, from its mother. "Gelding" is a male donkey that has been castrated so that it cannot reproduce. 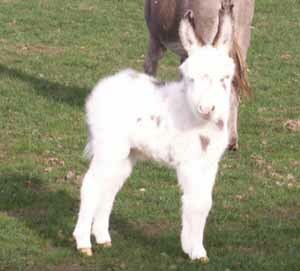 The gestation period of the miniature donkey is 11 to 13 months. The foal averages between 20 to 30 pounds at birth. Foals are up nursing within 30 minutes of birth. Foals are normally weaned between 4 and 6 months. Jennets SHOULD NOT be bred until at least 3years of age. 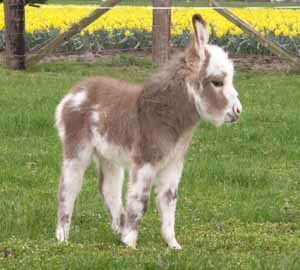 Miniature donkeys are not fully grown until 3 years of age. 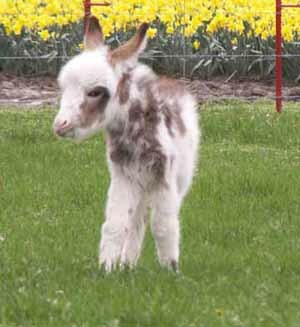 Everyone who meets a miniature donkey wants one of their own!